1. Heat the oil in a large saucepan and gently fry the onion for 5 minutes to soften. Add the garlic and fry for 2 minutes. Make a slit in the chilli and add to the pan with the split peas, thyme and stock. Bring to a simmer, cover and cook very gently for 35 minutes or until the peas are very tender (you should be able to mash them against the side of the pan). 2. Lift out the chilli and discard. Blend the soup using a stick blender or in a food processor until smooth. 3. Cut the kernels away from the corn cobs by holding the cobs upright on a board and slicing them away. Reserve 2 tbsp of the coconut cream and add the rest to the pan with the corn, sweet potato and jerk paste. Cook gently, covered with a lid, for a further 15-20 minutes until the sweet potato is tender. Lightly mash the potato with a potato masher to break it up. 4. 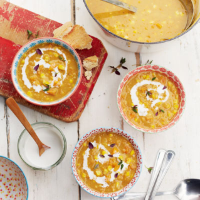 Ladle into bowls, drizzle with the reserved coconut and serve scattered with extra thyme. This hot, spicy soup is substantial enough for a main course, served with warmed bread. As an alternative, you could use 250g frozen sweetcorn instead of fresh. This recipe was first published in Tue Jun 18 15:50:00 BST 2013.